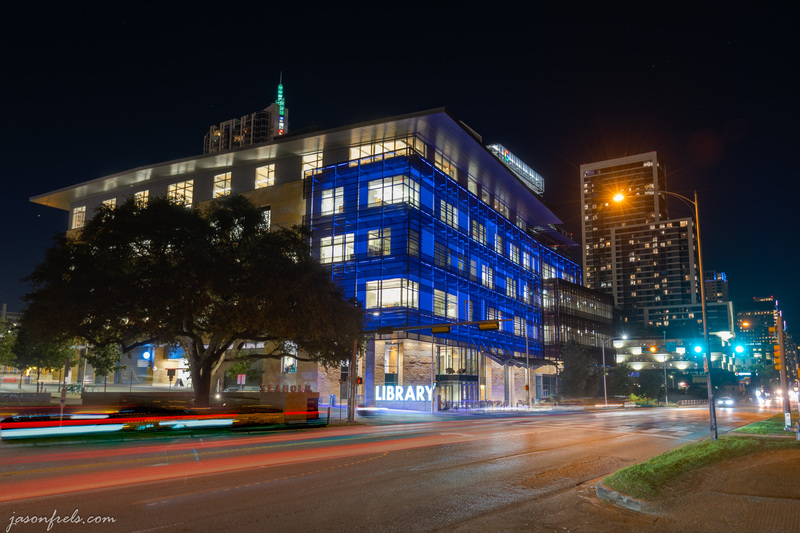 I have been wanting to try to photograph the Austin central library at night for a while. Maybe try some long exposure with the vehicle lights blurred on the street or HDR. I haven’t really been down around the library much, so I would be going down there cold without any real plans for photographs. Also, parking downtown is never very easy so I was concerned about that. But it turned out not to be a problem as I was able to park at the library for no charge. So, leaving my car in the underground library parking garage, was able to walk right up to street level and walk around the building, checking out different angles. I figured that I would try a few things, look at my photos, and perhaps develop a plan for future pictures. This first picture below is from down the street overlooking a terrace near the library. This is an HDR merge, as I hoped to make all of the colors and shadows pop. 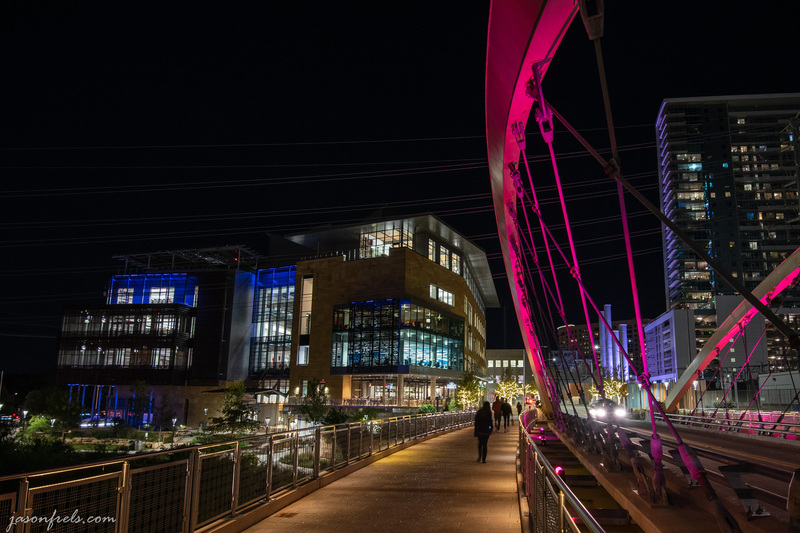 This was shot at 16mm as I was trying to get the library and the bridge lit by colored light to the right. When I framed the above photo the entire library was in the frame, but I must have moved my tripod a bit because it got cut off a little. Perhaps next time I will put on the 14mm lens for a bit wider shot. I am not crazy about the power lines running across the right side of the image, but I didn’t have the patience or skill to spend an hour in Photoshop making them disappear. 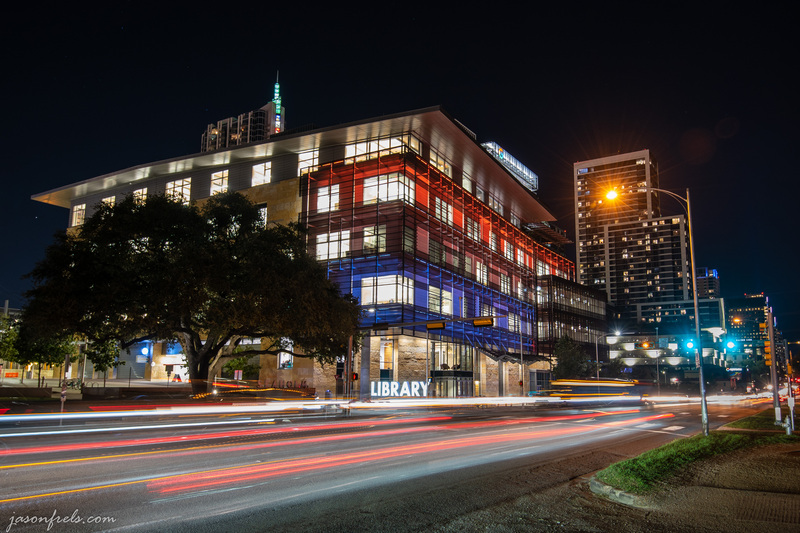 I do like the way the orange light showed up on parts of the library. The building in the background is still under construction, so not completely lit up. 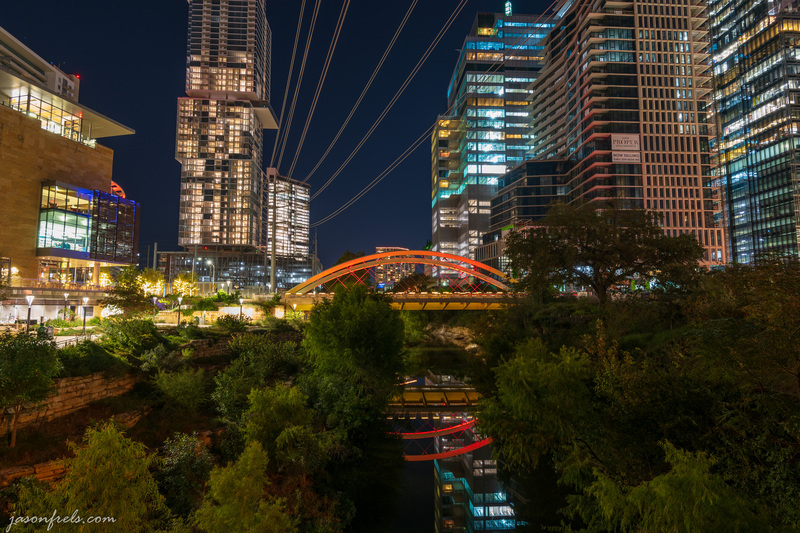 I next tried to get the colorfully lit bridge reflected in the little creek below. I did have to wait and time the changing colored lights on the bridge. There were a lot of trees that blocked most of the reflection. The above photo was taken on a bridge with a lot of traffic going past behind me. I was concerned that the vibrations of the bridge would ruin the photo at 8 seconds, but it doesn’t seem to have been a problem. Still don’t love the power lines. Next I walked around and tried a perspective shot from the bridge with the colored light on it. There were a lot of pedestrians on the bridge and I couldn’t decide whether or not I wanted them in the photo. I decided that it made the picture more interesting with people walking toward the library. The problem with the picture is that if you don’t know that it is the library, you have no idea what the people are walking toward. Also, the library is not very well lit. This may be a photo that would be better if taken during the post-sunset blue hour so that the architecture is more visible against the sky. I then headed across the street to the far corner. 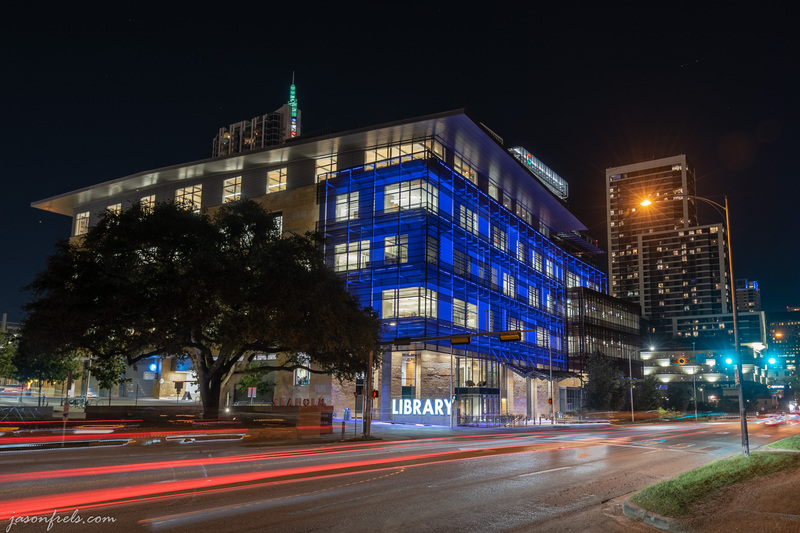 I wanted to get the library sign in the photo and maybe get some blurred vehicle lights. This is one of the busier streets in downtown Austin so there is no shortage of traffic. Across the street from the library are jogging paths and Lady Bird Lake, so I have plenty of choices for positioning my camera. I settled on a location that would include the library and a large oak tree in the frame, but moved the orange street lamp out of the way. This position also looks down the street to catch all the traffic. Catching the lights while transitioning between colors worked well, I think. And, this is just a 2 second exposure and I like it better than the HDR merges farther down. Perhaps next time, I would drop the ISO down and go for a 4 second exposure to stretch out the vehicle lights a bit more. The changing colored lights on the building make for an interesting photo, but was a bit of trouble to time with the traffic light and taking multiple exposures for an HDR merge. I was worried that the colors would be muddied in the merge. But I was able to get 4 or 5 shots before the color transitioned and still get some car light blur. The below picture is an HDR merge when the building was blue using Lightroom. One problem that I had with the Lightroom merge was getting the ghosting done well. If you look at the amber traffic light and some of the vehicle lights, you can see that the ghosting made a mess. I took the same series of photos into Photomatix Pro to make the following image. This gave me much more flexibility in dealing with ghosting of things that change from image to image. I had the most trouble with a car in front of the library sign blurring some of the letters, but I was able to get rid of it with enough patience. Another difference is that Photomatix Pro produces a TIF and Lightroom produces a DNG file. The next images is when the library lights are orange. This was processed in Photomatix Pro as well. With this picture, I saturated the colors a bit more to get a different effect. It does look a little overdone to me. I think I probably prefer the less overstated picture with the blue lighting, but I can go back and reprocess the images and get whatever I want. I think that my keeper of the night, is the normal exposure though. I went in thinking that HDR would really make the building and the color pop in the dark environment, and maybe it does, but I think that the HDR looks a bit over-processed. Tell me what you think in the comments below. I will probably head back down to the library again to shoot some more photos. 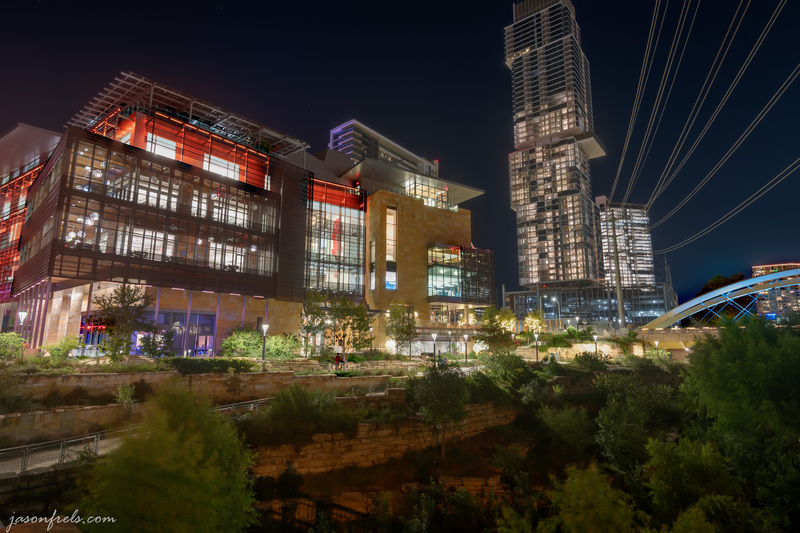 Some of my other photos of Austin downtown can be found here. I did experiment cropping, but the light is too close to the building and there is so much flare that it is difficult to clone out effectively. Moving farther down the street, the library sign is blocked by the traffic light post. I will return some time and try some different ideas. Maybe explore inside and check out some details.